Growing your email list has benefits beyond the obvious increase in size. For example, new subscribers are often more active than older ones. They just signed up for your emails and want to click and open them. For this reason (and many others) you should always strive to grow your email list. Doing so will help keep your engagement numbers healthy and ensure your brand is connecting with new prospects. Growing your database can seem daunting, though, with the number of tactics at your disposal. Thankfully, marketers have been running list growth campaigns for years. Here is a chart of 10 popular tactics, starting with the most effective on top. 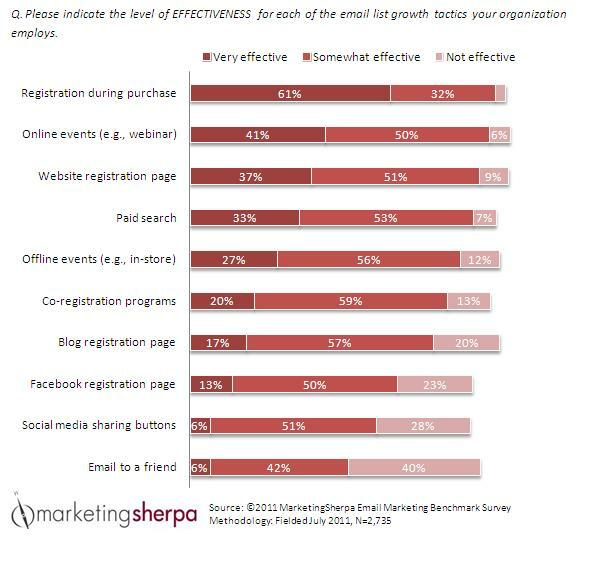 The chart is pulled from the all new MarketingSherpa 2012 Email Marketing Benchmark Report. Online events appear to work best in the software sector, with 46% of email marketers there saying the tactic is “very effective.” That number drops to only 24% in the e-commerce sector, which is understandable. When was the last time you attended an event to buy something on Amazon? Website registration pages are, far-and-away, the most popular tactic for growing email lists, with 75% of email marketers using them. Their popularity remains above 70% across email marketers who target consumers, businesses or a mix of both. This information is pretty consistent with what we’ve discovered at Digett while working to grow our own list. Most of our new subscribers come from landing pages: they fill out a form to get a whitepaper, and sign up for the newsletter in the process. I wonder about what is meant specifically by “Offline events,” in the first graph. Does this mean that the store’s putting up a sign at the register or on the front door encouraging people to sign up, or are they asking on an individual basis: “Thanks for your purchases, would you like me to sign you up for the newsletter?” I shop at places all the time that ask for my email address when I check out, and I generally end up on a newsletter even though I haven’t actually given them permission to email me. Hi Adam: Wondering who I can speak with about getting permission to use a high-res version of that chart above. Can you connect me with someone? From an eCommerce perspective, the easiest way we have found to grow our database (and reduce the number of opt-outs) is to offer an incentive for people to subscribe/sign-up to our email marketing.